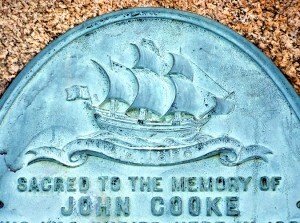 John Cooke arrived in America at the age of 14 in the year 1620 with his father Francis aboard the Mayflower. In 1652 Cooke was among the 36 Plymouth colonists who purchased Dartmouth Township from Wampanoag leader Massasoit and his son Wamsutta. Cooke was the only one of the original Pilgrims to actually move to the town, building a home and a garrison near Howland Road. 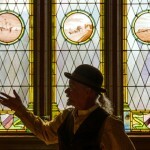 A Baptist preacher, Cooke represented the area at Plymouth Court for six years and performed a number of legal duties, making him an important figure of his day. 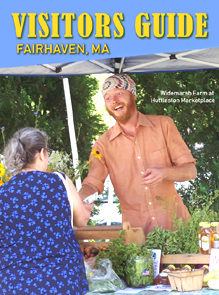 He was one of the town’s Selectmen in 1675 when Massasoit’s son King Philip attacked and burned much of old Dartmouth. Cooke had five daughters whose families—Hathaway, Taber, West and Wilcox—were among the most prominent in the region. 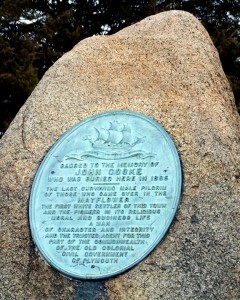 At the time of Cooke’s death in 1695, he was the last surviving male passenger of the Mayflower. In an 1888 lecture to the Fairhaven Improvement Association, Franklin B. Dexter, a Taber family descendant, suggested that John Cooke’s remains had been laid to rest on this property. There is no record of anyone making such a claim prior to 1888, almost two centuries after the Pilgrim’s death. 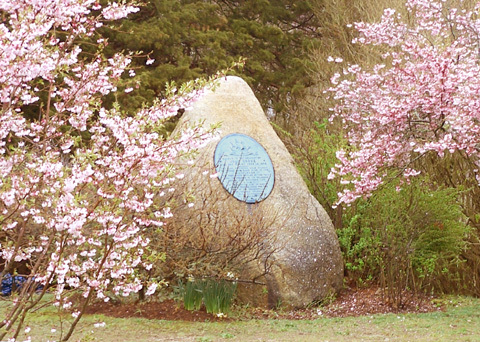 A boulder with a bronze plaque was installed in the park by the Fairhaven Improvement Association in 1903. 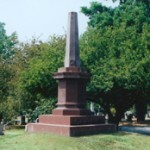 While this park is part of an area that had been referred to as a burial ground from the 1760s into the 1800s, no primary source records indicate who was buried there. 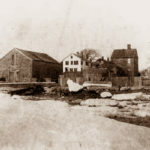 There is some evidence that suggests Cooke was more likely have been buried on Hathaway property in what is now Acushnet. His actual burial place is unknown. 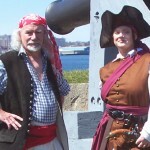 Also see: John Cooke, Capt. Joshua Slocum Memorial, and Dr. Hinohara Bench.